Three men who took part in an attack on members of a minority Muslim group in Indonesia have been sentenced to between three and six months in jail. 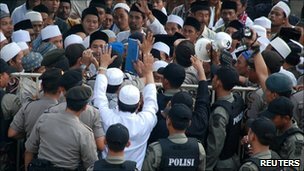 Three Ahmadiyah members were bludgeoned to death in west Java in February. Human rights activists said the court had sent a chilling message that attacks on minorities would be treated lightly by the legal system. The US embassy in Jakarta expressed disappointment at “the disproportionately light sentences”. “The United States encourages Indonesia to defend its tradition of tolerance for all religions, a tradition praised by President Obama in his November 2010 visit to Jakarta,” a US embassy statement said. None of the defendants faced murder charges over the mob attack in which 1,000 Muslims surrounded the home of an Ahmadi. The sentences handed down ranged from between three and six months in prison — well below the maximum 12-year penalty sought by prosecutors. Human Rights Groups say that despite constitutional safeguards of religious freedom in Indonesia, attacks on minorities have been increasing. Indonesia has the world’s largest Muslim population, but is a secular nation.